This half term we have lots of fun things going on all across Hampshire, for all ages, many of which are free. 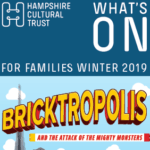 As well as our annual LEGO family exhibition “Bricktropolis and the Attack of the Mighty Monsters” opening at Milestones Museum on Saturday 16 February, there are loads of events and exhibitions going on throughout half term in the arts centres and all of the other museums too. As well as bookable workshops, most venues have free children’s make-and-takes and quizzes which you don’t have to book, just drop in. We have venues county-wide, the majority of which are free to enter! Please see leaflet for details.